The results showed that both time and type of flooring impacted the amount of these tracer bacteria on the food. There were more bacteria with longer time on the floor, and with hard surfaces than with carpet. These results are in-line with a previous study that tested the transfer of Salmonella from surfaces to food (if you are willing to call bologna food). In collaborating with others to investigate the microbiology of the built environment, I’ve come to learn that environmental engineers think a lot about the transport of particles — of which microbes are a part — and often with ingenious devices. 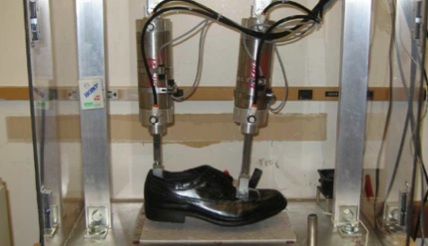 Recently, Sippola and colleagues in the Indoor Environment Department at Lawrence Berkeley National Labs published results measuring the “uptake and downlay mass transfer efficiencies of particles between shoes and floors in a step-simulation chamber.” They mainly focused on the issue of tracking particles around a building, and they showed that that the uptake of particles from the floor to the shoe tended to be higher on tile than on carpet — just like the studies that looked at the transfer of bacteria. In this case at least, bacteria cells follow the laws of physics. From the perspective of airborne particles in the built environment, though, transfer to another surface is different from resuspension — and the impact of flooring type is opposite. 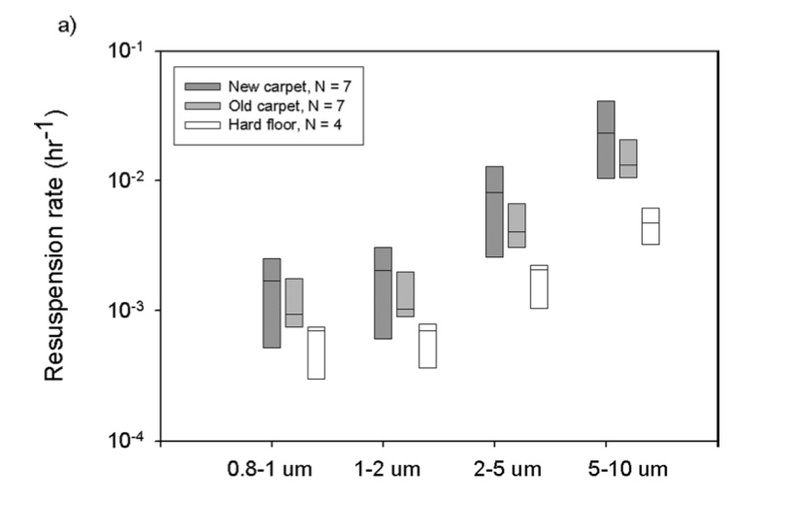 The aerosolization of microbes from flooring as a result of walking is a process that can greatly influence indoor air particle concentration (and by extension, the indoor air microbial composition, my colleagues and I hypothesize). When it comes to resuspension, rates are higher on carpet than hard flooring. 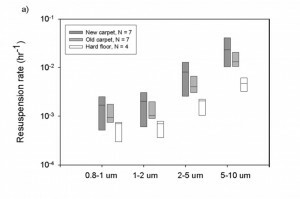 Unsurprisingly, there also tends to be a higher “particle load” on carpet than hard flooring, thus compounding the effect of higher resuspension rates — and supporting the recommendation that people with allergies should choose hard floorings in order to minimize exposure to allergens in dust. The contrasting outcomes — that bacteria on a carpet are less likely to get on your bologna but more likely to become airborne when your walk in the room — were confusing until I was able to separate these two processes of transfer and resuspension in my mind. I’m learning that in order to characterize the microbes indoors, you may not just have to consider the strength of the sources but also the processes that control their dynamics, i.e. their “dispersal” in ecological language. Great stuff, Rachel. thanks for sharing your knowledge with us. “When it comes to resuspension, rates are higher on carpet than hard flooring.” Is it clear that it is resuspension per se? I would imagine that the relative flexibility or potential displacement of a carpet fiber on which a particle might be “resting” would make it easier for a footstep to dislodge it and launch it into the air. But carpets are susceptible to static electric charges, so one needs to know the relative humidity conditions to generalize here. Yet another great example of how everything is connected and the environmental conditions can alter the results of microbial sampling — of surfaces or of air. Do you have any data that looks at these processes under different conditions of relative humidity and with carpets that have anti-static properties and on floors that are newly waxed or polished or sealed, etc.? Some of these details might matter too. I don’t know.